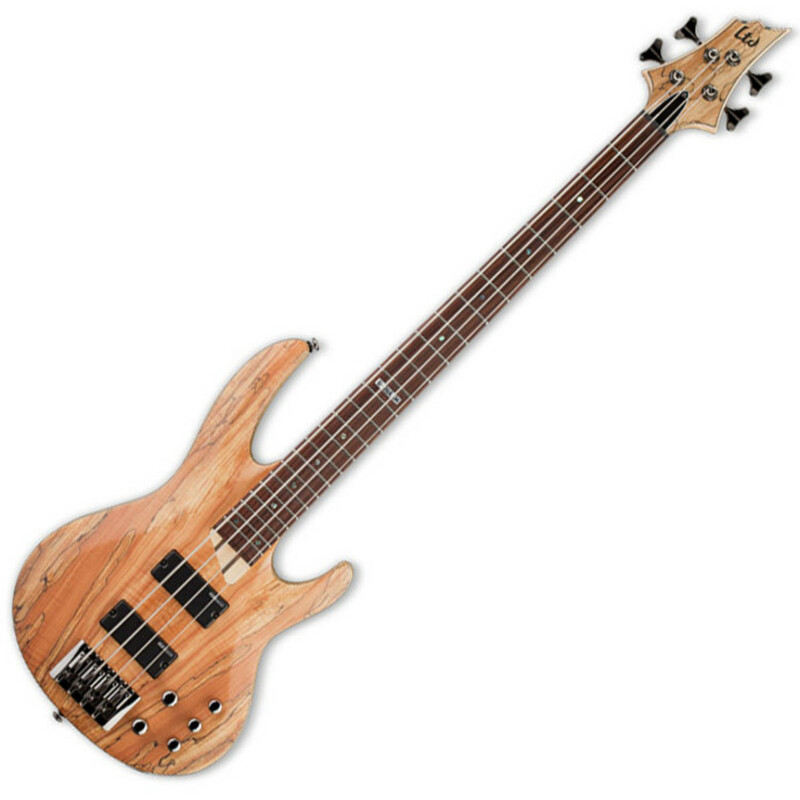 The ESP LTD B-204 Bass Guitar has a beautiful, natural appearance and a powerful bass sound. The B-204 is loaded with a pair of ESP Soapbar Pickups, and features ABQ-3 3-Band EQ offering a wide array of tonal possibilities. LTD Tuners and an LTD BB-604 Bridge offer a stable and reliable tone, all night long. The neck is crafted from both maple and rosewood for a tone with clarity, articulation and warm lows. The ash body provides bright tones with plenty of twang, and it is topped with spalt maple which not only offers great sustain but also a stunning visual. The spalted wood grain provides a textured appearance, and the B-204 is finished in natural satin with black nickel hardware. Loaded with a pair of ESP Soapbar pickups in the bridge and neck position, the LTD B-204 bass can achieve versatile and powerful tones; and accompanied by the ABQ-3 3-Band EQ which provides you with a flexible bass sound. The 5-piece neck is strong, sturdy and can cope with excellent amounts of fast and aggressive shredding. The maple and rosewood together, offer bright and clear tones as well a softer sound with great articulation. The neck is paired with a rosewood fingerboard which offers warm lows and a beautifully soft tone with crisp highs. The ash body delivers bright tones with good resonance. It also offers a light and comfortable playing experience, and a sound that has plenty of twang. The ash tones are both crisp and articulate, with firm lows and snappy highs. The ash body is topped with a visually beautiful spalt maple top, which provides excellent sustain with a great dynamic range. The spalt maple top offers a beautifully textured appearance, and it is finished with a natural satin to allow the wood grain to be visible through. Spalt Maple provides incredibly unique aesthetics, as the contrast between the grains adds another dimension to the appearance. The B-204 is loaded with quality LTD hardware, including LTD Tuners and a LTD BB-604 Bridge. They work together to reliably keep your tune stable, no matter how hard your playing style is. ESP is quite possibly the most revered manufacturer of heavy metal electric guitars and basses. ESP and its LTD brand are the first stop for many heavy metal icons, including James Hetfield and Kirk Hammett of Metallica, Jeff Hanneman of Slayer, Stephen Carpenter of the Deftones. As well as being the choice of metal artists the world over, some of Rock's most beloved characters like Bon Jovi's Richie Sambora and The Rolling Stones' Ron Wood are ESP users. In addition to these renowned artists, ESP is set to continue its dominance over the metal scene as the choice of some of today's most brutal acts, Alexi Laiho of Children of Bodom and Ozzy Osbourne's latest guitarist Gus G. ESP guitars are renowned for the quality of their construction and it's a well-earned distinction, as this quality is present in all their guitars and basses, from their top end signature models through to the more affordable LTD models. ESP and LTD Guitars and Basses feature high quality hardware and design features that are indicative of a company that has spent 35 years designing some of music's most brutal, hard wearing and road worthy instruments.